A dramatic increase within St. Augustine’s parish in Seymour, resulted in Archbishop Henry J. O’Brien’s establishment of the parish of the Good Shepherd, Seymour, on September 28, 1967. Father Martin T. Keane was appointed first pastor. Initially, the priest celebrated Mass at the Strand Theater on Main Street and then later at the Seymour High School auditorium. On October 22, 1967, a residence at 34 Kathy Drive became the rectory. By the end of December, Good Shepherd parish had purchased 5.4 acres of land on Mountain Road. By spring 1968, a new church was being planned and by 1969, an additional 4.3 acres of land was purchased. 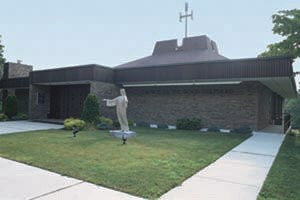 On May 17, 1970, Archbishop John F. Whealon formally dedicated the new brick Church of the Good Shepherd.